Dodge has just unveiled its new Avenger R/T at this year&apos;s New York Auto Show. In order to properly separate it from the standard and extremely unexciting model, engineers began by increase the roll stiffness by some 18 percent. This was accomplished by increasing the front spring rates by 17 percent and damper rates by 15 percent. Rear springs were also stiffened by 12 percent. A larger rear stabilizer bar was also added. The result is an improved driving performance and handling. 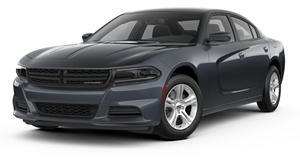 Power is provided by the 3.6-liter Pentastar V6 that produces 283 hp and mated to a six-speed automatic. Surprisingly, Dodge hasn&apos;t given any indication as to whether they&apos;ve upgraded the brakes. It should return 19/29 mpg city/highway and features exterior enhancements such as a body-color grille and R/T graphics on the front fenders. There are also 19-inch alloy wheels and the interior receives a special gauge cluster with a tachometer. A special perforated leather steering wheel, special fabric seats with embroidered logs, and "SRT-inspired" pedals are also included. Pricing has not been announced.